After being teased at the 2018 WWDC, The macOS version of Microsoft Office 365 has launched on the Mac App Store. 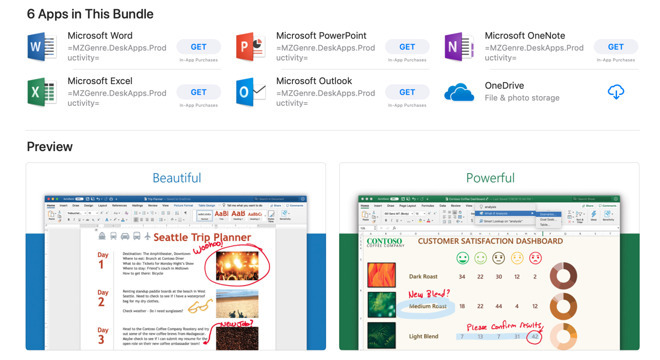 The individual apps including Word, Excel and PowerPoint have previously been available for the Mac only on Microsoft's own Office 365 website while the iPhone and iPad editions have long been on the iOS App Store. The major Microsoft Mac apps are downloadable for free if you just want to read documents. The Office 365 subscription service can be paid for with an in-app purchase from inside any of the apps commensurate with the Office 365 subscription price. During the unveil of the new Mac App Store at WWDC, Apple said that Microsoft, Adobe, Panic and more would be either coming or returning to the store. Most of the promises have yet to materialize, however. "We are excited to welcome Microsoft Office 365 to the all-new Mac App Store in macOS Mojave," Apple Senior Vice President of Worldwide Marketing Phil Schiller said at the time. "Now it's easier than ever to get the latest and best version of Office 365 for Mac, iPad and iPhone." You can download the apps -- Word, Excel, PowerPoint, Outlook, OneNote and OneDrive -- individually or in a Microsoft Office 365 bundle. If you are willing to purchase Microsoft Office through platforms other than the App Store, there are a variety of deals going on now. B&H Photo is currently knocking 28% off Office 365 Personal with a clippable coupon, bringing the price of a one-year subscription down to $49.99. Amazon also carries MS Office with discounts of up to $20 off. Ah, consumer software subscriptions, the next big ripoff. About bloody time. I’m sick of having a shoddy, manual/proprietary update experience on our Macs. It’s like being back in the 90s. The question is; will MS actually keep the latest version on the Mac App Store? So far they haven’t with other apps. What other apps from MS that are on both Mac App Store and on their own website don't have the latest version in each place? OneDrive has been on the Mac App Store for quite a while. It gets updates all the time. Almost too often! Seems like every few weeks there is an update with a somewhat vague description of what the update is supposed to improve or fix. The thing that was just released? Do go on. So, how does this work with family sharing? I had a bit of a problem with iBank (Banktivity... whatever they're called this week) when I went from 6 to 7. Yes, it's "free" to share with the family, but each family member has to upgrade for $35 to use it after a month. Will that be the same? I already have the family Office, where I can install it on 5 computers. Will I have to do in app purchases for each one now, should I wish to do this? I absolutely hate that Apple has removed in-app purchase prices from the App Stores. How can I compare the cost of the Office bundle versus the 3 programs I actually need (Word, PPT, Excel)? I have to download the bundle first (a 4.1GB download) record the price, delete all the apps, download the individual versions and see what they cost... and if the bundle was a better deal, delete the apps and re-download the bundle?! Is there a simpler way? So, how does this work with family sharing? It doesn't. The App Store says it does, but in-app purchases (which are required to actually purchase the software) are not. You'd need a monthly/yearly Office 365 Home subscription for up to 6 people. Office 365 Personal, Home, and Solo at $69.99, $99.99, and $119.99. I literally cannot for the life of me find what Solo is anywhere on Microsoft's website, which is par for course with them, but it's definitely not solo apps.